In the last week of June 2017 I travelled to Chamonix with my good friend Dan, to spend a few days re-acquainting myself with some Alpine mountaineering, something I have not done in a few years. Awaiting an operation on my knee I am unable to run but, through some good fortune, it seems I am still able to walk for long periods of time so this trip has been my main mental focus for some time. I have also been looking forward to writing about it. But how do you write a trip report when the weather stinks? I could talk about whiling away an hour in the Alpine Museum in Chamonix or having one too many beers in the afternoon or Dan, responding to my suggestion of a digestif and an early night, by ordering a third carafe of wine. But that's not what these pages are supposed to be about! So, instead here are some extracts from my daily morning journal and a few videos and notes to brighten the gloom. Check out my trip photos on The Armchair Mountaineer's Facebook page. Early start. James* will be here to pick us up at 7 am. We decided yesterday to head over to the Italian side of Mont Blanc although conditions are too poor to attempt the summit itself, given the recent heat. The Dix hut and a couple of days in Switzerland is out because of impending poor weather, so the Rifugio Torino and the top of the recently build Skyway lift gives us access to the Mont Blanc massif and the possibility of some good shorter, mixed routes. It is not the quite the way we wanted to do this - racing as we are, up above 3000 metres, but this way we should get up there at a reasonable hour, in time to dump our packs, step into our crampons and make the most of a decent forecast for most of today. 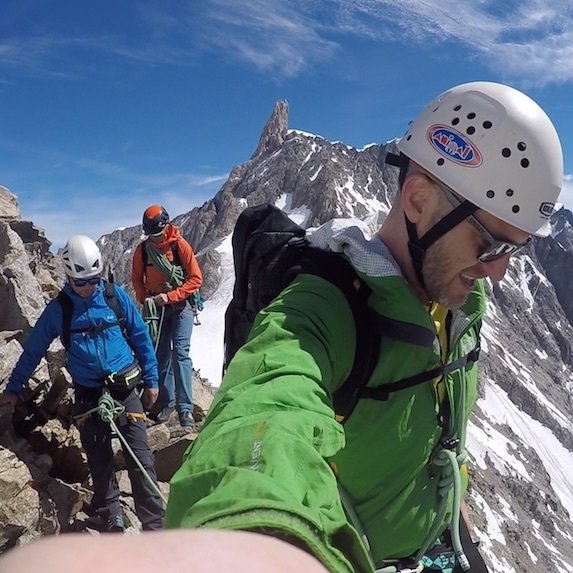 We ended up enjoying a decent day traversing the Aiguilles Marbrées as shown in this video. The past is a foreign country. It seems that way when spending time in the mountains. Yesterday, largely bathed in sunshine, we completed the traverse of the Aguilles Marbrées, from the Torino hut. Now, it's just gone 7 am and we are holed up inside the hut, lashed by rain and buffeted by wind. Under my sleeping bag the only sounds are my own irregular breathing, the occasional whining of wind and the muffled bang and clatter of a mountain refuge. Is there anything more tedious than this? Lying in a bunk; comfortable because I got to lie in a little longer but head filled with a mad mixture of dread and anticipation. We had breakfast at 6 am this morning amid the other frustrated, twitchy souls whose expectation is to get out on the fields of ice and snow, to labour, to earn their rest and not have it thrust upon them. One more hour's kip. A flick of the curtains has revealed an impassable mist and fast-streaked window pains that speak of unrelenting bad weather. The Aiguilles Entreves will have to wait. Sadly they are not impatient. At around 9:30 we decided to head out onto the glacier and up the Petit Flambeau, no more than hour’s round trip from the hut, taking into consideration a decent pause to absorb a history lesson from James, who described how the opposing forces had briefly battled over this part of the high Alps. Then, we returned down for some rock climbing on Chamonix’s local crag; Les Gaillands, encouraged to see many familiar faces from the hut were also there. We weren’t missing out on anything higher up. Back in the valley… today a via Ferrata in the morning and rock climbing this afternoon. It’s not why we came. In the end, by the time we were walking back from the Via Ferrata the rain came and didn't relent all afternoon. On transfer back to Geneva. We tried to do a route on the Aiguilles Rouges yesterday but failed. It looked promising as we took the Flégère lift. But before long it started to turn; mist self generating, like the smoke from a genie's lamp, shrouding the white peaks, offering occasional glimpses of what might have been but thickening to a heavy blanket of cloud which lowered itself and stifled our day. Sun. Rain. Hail. Snow. The lot. Four seasons in one hour. We hiked in to the base of the climb only to turn back due to terrible weather. It was windy on the ridge and it just didn't seem sensible to go on. So we walked to Lac Blanc which has some of the greatest views of the Mt Blanc massif... only to see nothing. The rain was constant. We were soaked to the skin by the time we reached the lift station again..
Now, of course, it is cloudless. And we must wave goodbye to an enjoyable but ultimately disappointing re-introduction to alpinism. Our guide; James Thacker, was a trooper. As disappointed as us, by the weather, he did his best to keep us entertained, but there was no escaping the fact that what we failed in what we came to do.